2018 update: We currently have a lot of small and premature baby items, so please avoid sending those for the time-being. Thank you. For alternate knits, please visit our patterns page. Statistics have shown that a hat is very useful to a small baby in helping it regulate its temperature and can in some cases make a difference between being admitted to the unit and staying at home. In order to comply with hospital control of infection policies the hats are offered as gifts to the parents as soon as the baby is admitted to the unit. 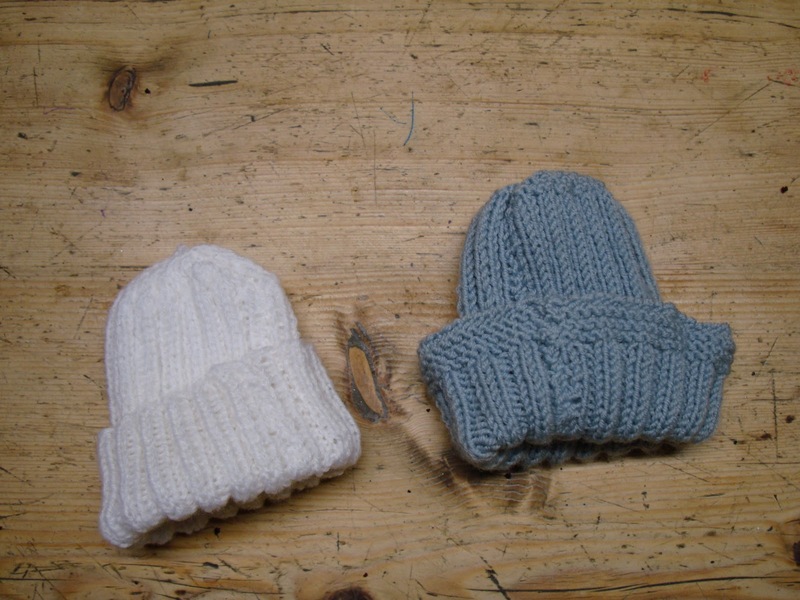 This means that the family are responsible for washing and caring for the hats achieving two very important aims. Firstly, as the washing is not being mixed with other babies on the unit there is a reduced chance of cross infection. Secondly, and just as importantly, being able to do something for your baby, no matter how small, is very important for parents who aren’t able to cuddle or care for their babies while they are being treated and helps them bond as a family. Because the hats go home with the family, the unit needs a steady supply of over 500 hats a year. Ribbed hats are preferred as they fit most sizes of head and most bright colours apart from yellow are very popular with families. Yellow can make babies look jaundiced and is best avoided. Hats have already been donated. Special thanks go to the students of Kingston University and the women of HMP Drake Hall for their hard work but as you can see, we always need more. Below is a pattern you could use, or you can have a look at one provided by the BBC. 4 ply yarn, 3.75mm (size 10) needles. Cast on 68 stitches, work in K2, P2 rib for 48 rows. Shape crown, (K2 together, K2) to end of row. Next and alternate rows, purl. (K2 together, K1) to end of row. (K2 together) to end of row. Break of yarn leaving about 14 inches of yarn to sew up hat. Thread yarn through stitches on needle and stitch up seam of hat. Do not press as this will flatten the ribbing and make it less easy for the hat to ‘mould’ to the babies’ head and stay on. Hi I would love to knit hats for prem/babies and I would also like to know if you need knitted cardigans/jumpers etc. We have a call for all of these things. Do send some in! Let us know if we can help in any way. Hi Jackie, we’d still love to receive hats. We need hats for all ages, from premature babies to adults, but especially for children aged 3-8.